Bruno’s Restaurant & Bar was the venue for the “Braida” Italian wine dinner held on Friday the 5th of September. 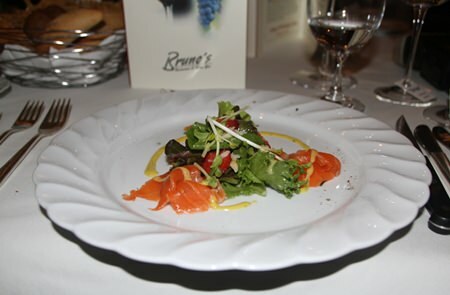 Bruno’s has for many years been synonymous with fine dining in the city and this wine dinner was no exception. The event was organized in conjunction with Siam Winery Co., Ltd. and was, as you may expect, sold out. Upon arrival, guests were treated to a welcome glass of sparkling brut chardonnay accompanied with assorted hot & cold canapés. Luca Ardiri, the export area manager for Braida, gave a short speech, followed by Fredi Schaub from Bruno’s who welcomed the guests and gave a brief outline of the meal that was to follow. 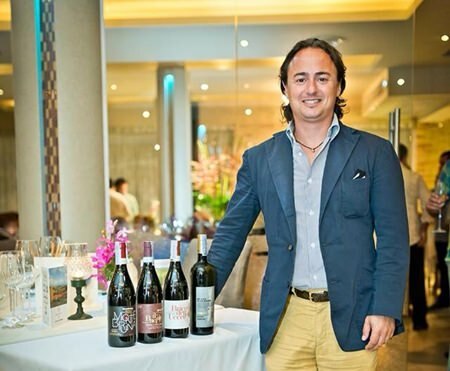 Luca Ardiri, the export area manager for Braida, stands by his wines. The five course menu commenced with in-house cured salmon gravlax over baby greens, strawberries and macadamia nuts in maple cider vinaigrette, which was served with the Collio Pinot Grigio Russiz Superiore 2012. This innovative starter kicked off course after course of highly creative and challenging dishes. Luca Ardiri and Fredi Schaub give a brief outline of the meal and matching wines that were to follow. This was followed by a 63 degree slow poached egg, with braised mushrooms, spinach, goose liver, parmesan foam and crispy bacon, a delightful dish paired perfectly with the 2012 Braida Montebruna. 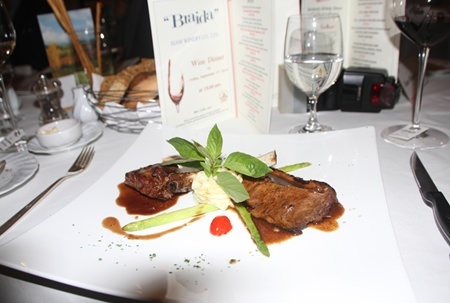 The main dish was the spectacular and perfectly cooked red wine braised beef brisket and lamb rack, with potato, asparagus and cherry tomatoes accompanied with the 2012 Braida Il Baciale Monferrato Rosso. The five course menu commenced with in-house cured salmon gravlax over baby greens, strawberries and macadamia nuts in maple cider vinaigrette. Interestingly, the most expensive wine the 2011Braida Bricco Dell’Uccellone was held back until the cheese course – a somewhat brave move that paid off as the cheese surprisingly offered the perfect coupling with this hearty, full-bodied red. The meal was rounded off with the 2013 Banrock Station Moscato served with pear frangipana tart and tea & coffee. 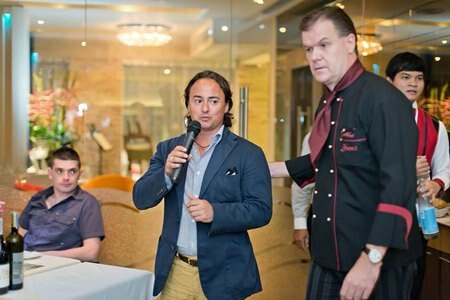 Wine dinners are a common occurrence in Pattaya but the real magic is conjured up when a dedicated team works together to create something memorable and this was certainly the case with the Braida wine dinner. Previous articleWhat happens if you die in Thailand?